After the fuss yesterday about the Infinite Warfare disk being required to play Modern Warfare Remastered, Activision have clarified the issue in a new FAQ. Modern Warfare Remastered requires a download, but accessing the game depends on which console you're using. PS4 players will use a voucher code contained in the Infinite Warfare box which you'll have to input in the Playstation Store in order to download Modern Warfare. Xbox One players will find Modern Warfare included on the Infinite Warfare disk but you need an internet connection to activate the game. So, do you need a disc inserted to play Modern Warfare Remastered? Yes – but there is an exception, which we'll explain in the paragraph below. For most PS4 and Xbox One owners, you'll need the Call of Duty: Infinite Warfare disc in your machine to play Modern Warfare Remastered's multiplayer and campaign modes, when Infinite Warfare launches on the 4th of November. Steam users have it easy and will be given a single key that accesses both games. However, if you pre-ordered either the Digital Deluxe Edition (£94.99) or the Legacy Edition (£79.99) via PlayStation Store on PS4, you'll be able to play the Modern Warfare Remastered Campaign mode without a disk tomorrow. You'll still have to wait until 4th November for the multiplayer mode, but let's take things one step at a time. So, how can I play Modern Warfare Remastered's campaign tomorrow i.e. 5th October? 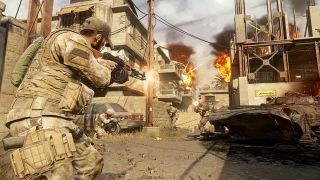 If you want to play Modern Warfare Remastered's campaign mode before the launch of Call of Duty: Infinite Warfare on 4th November, you'll need to pre-order either the Digital Deluxe Edition or the Legacy Edition on PS4 via the PlayStation Store, which you can do anytime before Infinite Warfare's launch – and Modern Warfare Remastered's campaign mode goes live as a PS4-exclusive from 5th October. Phew. The small print goes on to say that an internet connection is required, though it doesn’t specify whether this is needed just to download Modern Warfare Remastered or if you need to remain online to play.